Without any doubt and time will confirm it, one of the best series and as relevant as unknown to many, is the one that we present you in the form of a text adventure. The Prisoner was filmed between 1967 and 1968. It was thought up by Patrick McGoohan and George Markstein, the first one being its main actor and produced by ITC Entertainment. On the whole they filmed 17 episodes which lasted 50 minutes each. 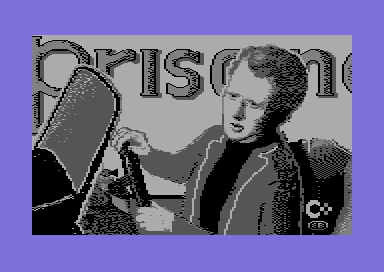 The series, and game, begins with the resigning of the main actor of his job in the British Secret Service. He, going back to his apartment, wants to leave quickly from there to go far away. 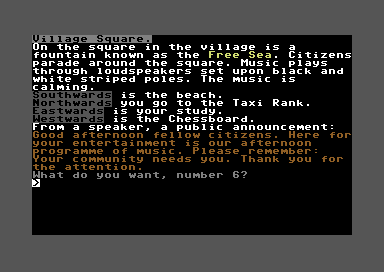 But he is caught with sleeping gas and is taken to a misterious beach village called The Village. There he is given number 6 and he tries to escape by all means possible while he is trying to find out who is number 1 and if this number is the person who is in charge of The Village. 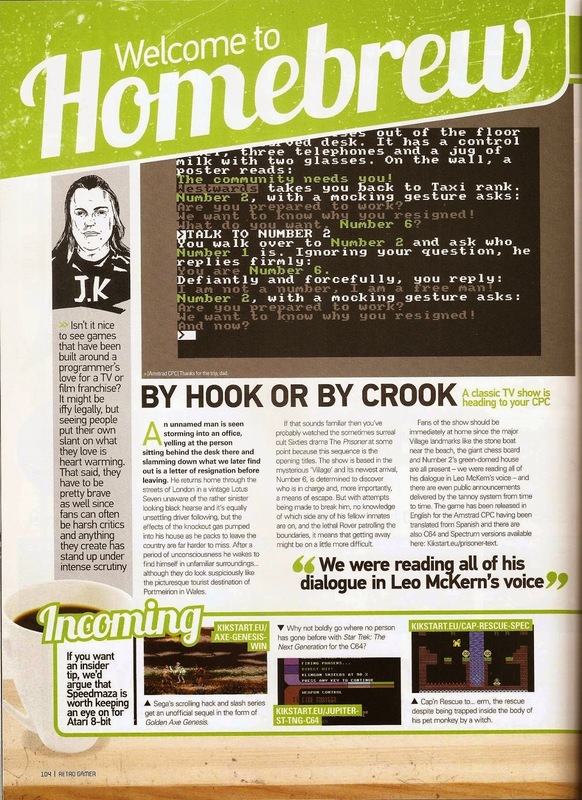 Unfortunately for our c64, there exists no adventure, no game refering to the series and so we decided to produce one trying to be loyal to the series, making it the most similar to the script and striving that it should be entertaining. 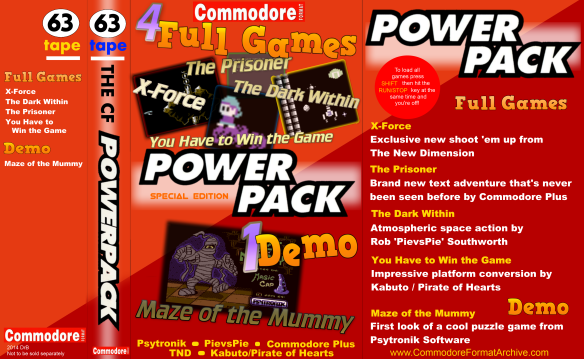 Besides we had the cooperation of Rockersuke and MiguelSky to manage to publish the 3 versions at the same time, Amstrad CPC, Commodore 64 and ZX Spectrum. The music for the version of C64 was a colaboration by Baron Ashler of Kabuto Factory. What must you do? Who brought you here? And why? All these questions you have to work out by playing and putting yourself into the skin of number 6. It is on your hands to discover it. 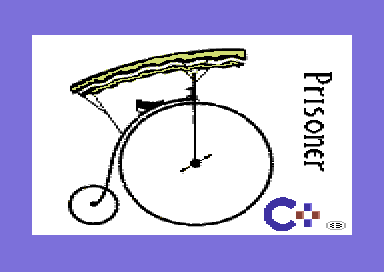 We have 3 lots of The Prisoner on tape, recorded on side A in Spanish and on B side in English. Besides we give, as a present, 3 copies of Castle Belmar/Castillo Belmar (Paul Dunric) also in both languages and compatible with C64, VIC20 and the MAX Machine. This little adventure is in 2 languages too and Lobogris translated the original into spanish. 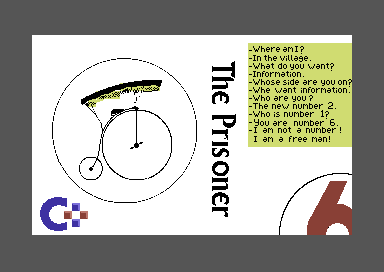 The game is only downloable with tape number 63, from Commodore Format. You can grab the TAP file on the link that is in the bottom of this post. To win one of the prizes you have to finish the adventure and explain us in a mail that you have to send to our address: commodoreplus@gmail.com how it ends. Furthermore you have to add your personal address, the Nick and your WEB address, if you have one, so we can publish the results and send you the prize. Commodore Plus keeps the right to decline any answer which is considered not convenient and doesn't perform the general rules. Hurry up and start to play the game to help escape number 6 from the Village. Goat Tracker from Covert Bitops. David Stimpson for his Prisoner knowledge and help. HERE you can go to the Spanish release and downloads. HERE can you load the special edition from Tally-Ho newspaper about this game.